An online archive—also called an archive mailbox—is a place where you can store old email messages so they don't take up space in your primary mailbox. Your IT or Office 365 admin creates the archive mailbox for you. Note: In order for your archive mailbox to work with Outlook for Mac both your archive and primary mailboxes must be either on an Exchange Server (on-premises) or on Exchange Online in Office 365 (cloud). If your primary mailbox is in on Exchange Server, for example, and your archive account is in Exchange Online in Office 365, you won't be able to use your online archive. Talk to your IT or Office 365 admin about co-locating them. 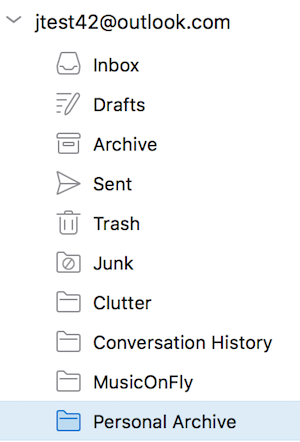 Although you can move individual messages from Outlook for Mac to your archive mailbox one by one (you can't move or copy multiple items at once), the more efficient way to make sure your messages get archived is to use Outlook Web App archive and retention policies. Archive and retention policies are set by your IT or Office 365 administrator. Archive policies control how long messages are left in an email folder before they're moved to an archive; retention policies control how long your messages will be saved. Although admins set policies for the entire organization, you can override the policies to suit your needs. See Retention and archive policies in Outlook Web App for instructions. If you want to archive multiple messages at one time, and no archive or retention policies are in place, use Outlook Web App to move the messages from your primary mailbox to the archive. You won't be able to move folders but can move all the messages in a folder at once. Check the box next to all the messages you want to archive. Drag them to the folder in the navigation pane labeled Personal Archive - <your name>. Note: If folders, calendar items, contacts, tasks, or notes were moved to your archive in any other version of Outlook, such as Outlook for Windows, you won't be able to move them or view them in the archive mailbox using Outlook for Mac. To search within the archive, select an archive folder in the folder pane. You can’t search your mailbox and archives simultaneously. You can create inbox rules to automatically file messages into folders, assign messages to categories, or redirect messages to another account. These rules don't carry over to your archive mailbox, however, and you can't redirect messages to your archive using an inbox rule.